Mike Hawthorne: Time to pre-order Deadpool vol. 7, the "Zenpool" arc! Time to pre-order Deadpool vol. 7, the "Zenpool" arc! 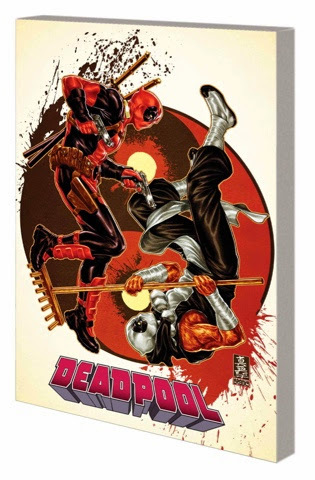 You can now pre-order Deadpool vol. 7, the entire AXIS tie in arc, featuring my redesign of Deadpool - Zenpool! I'm especially proud of this arc, so be sure to tell you local comic shop to save you a copy. Get ready for a different spin on the Merc with the Mouth! Since the events of AXIS inverted him, Deadpool has given up violence in favor of enlightenment! You heard right — Deadpool has gone Zen and found peace! So how is he going to help his “FauX-Men” friends live through an attack by the real, also-inverted X-Men?! I don’t know. Probably not very easily. It might involve cowboy stuff. Then, our wall-crawling hero is stalked by a classic Spider-Slayer! Wait, this isn’t a Spider-Man book. So what is a Spider-Slayer doing here? Deadpool had better find out before it mistakes one red-clad, wisecracking hero for another — and mashes DP into spider-paste! Plus: The Roxxon Corporation brings us a special educational story! Learn about gracking, the energy source of the future! Collecting DEADPOOL (2012) #35-40.